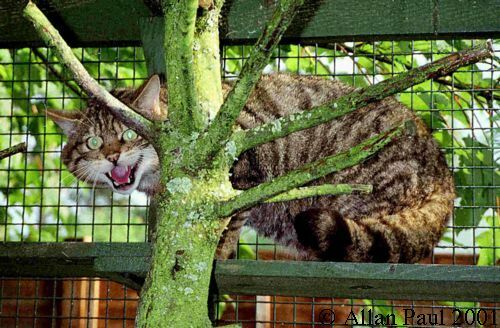 The popular image of the Scottish wildcat is of a bristling, snarling, flat-eared demon, with all its weaponry of teeth and claws set for war. This is a myth, often perpetuated by artists and photographers portraying as the norm a cat at bay, cornered, caged, or so terrified that it has to unleash its total armoury in self-defence. Of course, wildcats do bristle and snarl and flatten their ears and hiss explosively, but most of the time they pad around like any other cat, with their ears unglued from their skulls and their teeth locked away. The contrived portrait becomes living truth when you see a big cat bayed on a crag by terriers or a mountain fox. Then you will see explosive cattiness, with moon eyes slitted, back arched, tail bottle-brushed, and teeth bared to the gums. And to hear the wild pibroch of her - scream, sob and skelloch - is to know the spirit of the wild places, which she shares with the eagle and the mountain fox, the raven and the red deer. The wildcat inhabits forests and rocky hillsides up to 450 meters. It dens down in rock cairns, under tree roots, sometimes even in the disused eyries of a golden eagle. The kittens, usually four, are born in May, and are self supporting at the age of five months. Second litters are not unusual. The male wildcat holds a territory which he defends against other males, but his hunting range extends far beyond that area. Wildcats prey mainly on small animals, particularly voles and woodmice, but they also kill rabbits and mountain hares, especially leverets. From mouse to hare is the normal range of prey, but a big wildcat can kill roe deer fawns, and sometimes even does. Wildcat kittens in turn, are sometimes taken by the golden eagle and the mountain fox and there is strong presumptive evidence that mountain badgers occasionally take them too. There are many cats running wild in many parts of Scotland, but they are deserters from the fireside of man , which are not, and can never become wildcats however long they may lead the free life. The true wildcat is a species, not a way of life. It is difficult to over-estimate the importance of game preservation in the last 150 years a factor controlling wildlife populations in Scotland. The wildcat, like the pine marten, took heavy punishment from the game ascendancy in the nineteenth and twentieth centuries, and by the time of the First World War it was not to be seen south of the Great Glen. The early decline in such carniverous species as the pine marten and wildcat has only been reversed with the gradual decrease in activity by gamekeepers since the end of the First World War. Since the Second World War it has been spreading, and is now found well south of the Great Glen; it is common in Banff, Angus, Moray, Nairn, Argyll, Perth and West Aberdeenshire. It has long been said that the wildcat is untamable, but although this is true of adults or well grown young it does not apply to hand-reared kittens taken before their eyes have opened, or shortly afterwards. In recent years the wildcat have shown shown exciting signs of a more regular return to the south of Scotland - the last wildcat recorded in the Borders was in 1849.